Mango is still in season here down under. It’s my family’s all-time favourite fruit. What makes me even feel happier is that the mango tree grown in our backyard bears more large mangoes this year. Every mango is large, juicy and sweet. 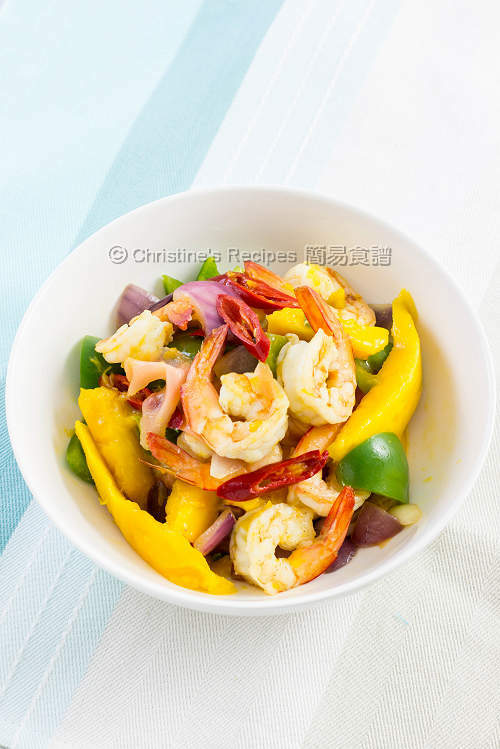 Prawns (shrimps) are classified as a kind of high cholesterol food. Many people might have an appetite or urge to try but feel hesitated with a fear of cholesterol problem. Well, I felt the struggle before. I’m glad that recent research posted by dieticians and experts states that most of the cholesterol resides in the shrimp heads. If you don’t eat the shrimp heads and what’s inside, you won’t intake much cholesterol. The prawn meat consists of high-quality protein, low in saturated fats unless you deep fry them in oil. 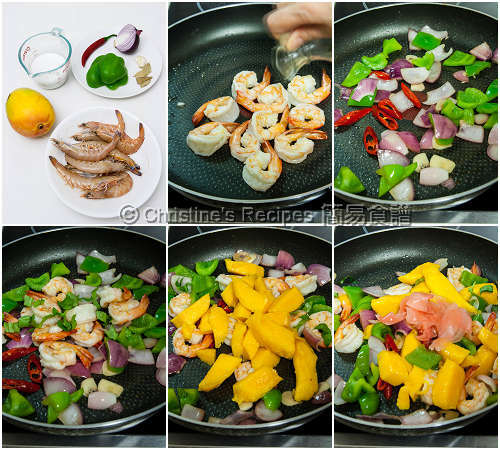 Best of all, prawns are rich in omega 3 fatty acids and good to our hearts. 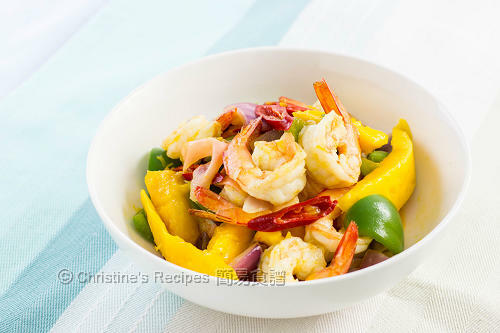 Prawns and mangoes are perfect partners for making a perfect quick dish, like this prawn stir fried dish. Seeing hubby enjoying it very much increase my joy of cooking. For all these reasons, I reckoned it’s the most favourite dish I made in this summer. Rinse the prawns thoroughly. Wipe dry with kitchen paper. Season with salt and pepper. Heat oil in a wok or frying pan over medium heat. Pan fry the prawns until both sides are opaque. Sprinkle wine. Stir to combine. Set aside. In the same wok, add a little oil. Saute garlic. Add onion and stir fry until translucent. Add capsicum and red chilli. Pour in the chicken stock. Season with salt. When the capsicum is turned soft. Stir in the mango and pickled ginger. Toss back the prawns. Stir to combine. Serve immediately. For better presentation, leave tails intact when shelling the prawns. Beware that the heat intensity of different types of red chillies are so difference. After removing the seeds, it will reduce the heat significantly. Mango is fruit. Make sure not to cook it too long. Simply stir to combine, then can be served. Delightful! 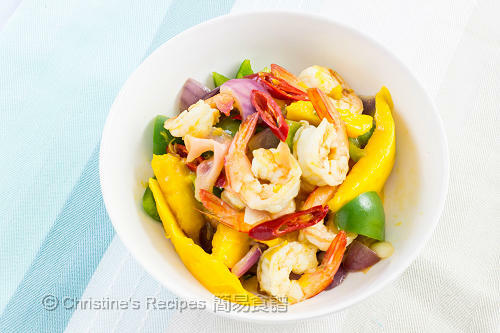 I like to add tropical fruits to my seafood stirfry too. Thanks for sharing, Christine.